Closed. 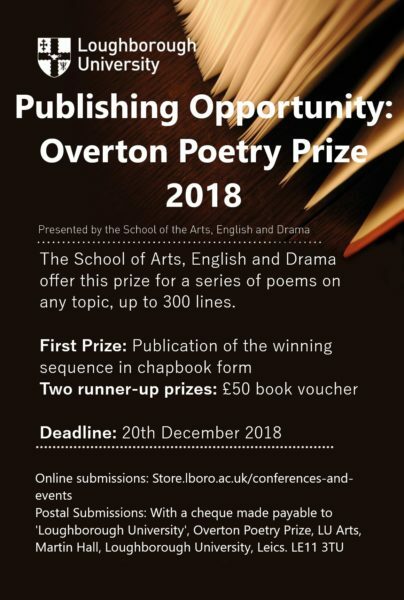 Loughborough University gives the Overton Poetry Prize for a series of poems, on any subject -up to 300 lines. The winner of the competition will get their work published in chapbook form, with two runners up each receiving a £50 book token. The cost of entry to the competition is £12, and the money raised from this will help fund an early-career poet in residence at the University. Anyone of any writing ability can enter the competition which is open to those 16 Years +. The deadline for entries will be the 20th December with the winner being announced in February 2019. For more information about how to enter visit their website.